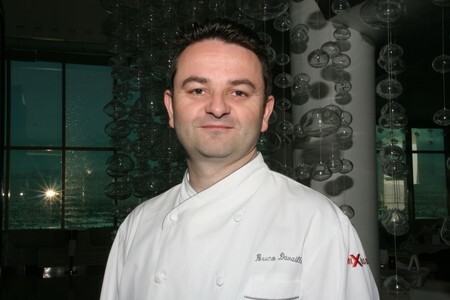 Internationally acclaimed Chef Alain Ducasse opened his first Las Vegas venture, Mix, in grand style in 2004, delivering not just a restaurant but an entire experience. Situated on the 64th floor of the Delano hotel (Mandalay Bay), Mix offers unparalleled views that extend from the Strip to the mountainous horizon. A dazzling white monochrome dining room punctuated with vibrant red accents provides a clean backdrop for the 15,000-piece "Champagne bubble" chandelier to make its mesmerizing impression. The highly seasonal kitchen constructs dishes that meld international ingredients with an incomparable French flair. Those interested in toasting to their evening with a glass of wine may choose from 1200 bottles stored in a two-story unit that forms the dining room's south wall. To top the evening off right, many guests make their way to the Mix lounge, where more glamorous revelry is to be had. 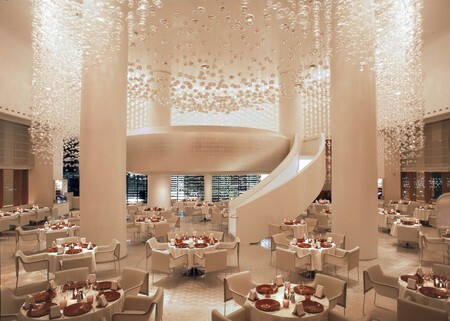 When renowned French chef Alain Ducasse chose to open his first Las Vegas restaurant, he did it in high style, crowning a deluxe new Mandalay Bay tower called THEhotel. To execute his vision, he hired compatriot Bruno Davaillon, a chef raised in France's Loire Valley who shares his produce-driven approach. 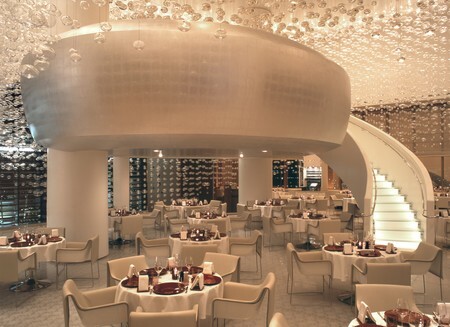 Since opening in late 2004, Mix has earned a well-deserved reputation for globally informed French cuisine, Patrick Jouin's stunning design, and spectacular views of the Strip. Unlike most restaurants in town, which are attached to either a casino or shopping mall, Mix features a private entrance. Take the glass-fronted elevator to THEhotel's 64th floor, enjoying unparalleled 180-degree views of the Green Valley below. Exit the elevator and enter a sumptuous black lounge that emanates from a central oval bar. The massive molded core of the bar is designed to look like red coral. On the ceiling above the "coral" is a fiber optic field that shimmers like the night sky. The lounge contains wavy back-to-back black leather benches, separated by a strip of red light, plus white tables, black leather stools and floor-to-ceiling glass walls. Outside, there's a deck with brown banquettes and white tables. Whether you sit inside or out, expect more stunning Strip views. 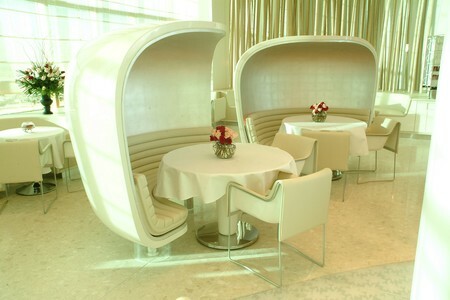 Walk past the open kitchen to the pristine dining room, all white, including the tablecloths, walls and futuristic pod-shaped booths. 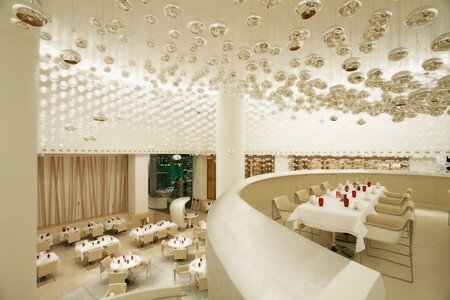 A 15,000-piece "champagne bubble" chandelier drapes from the ceiling. Lining the north wall are wood poles designed to resemble a bamboo forest. Strangely, the poles aren't bamboo, but they're still attractive. Up white stairs is a private dining room with tables for large parties, lit by pod-shaped silver lamps that offer unobstructed views of fashionable diners below. A two-story wine rack forms the south wall. Along the east wall is an outdoor patio, great on a rare cool evening. Two-story glass walls flank the dining room, to maximize those views. The only flash of color: red glasses. Each table holds a pad of Mix stationary with a pencil, to write about your meal or to pass notes to tablemates. During the week, the crowd primarily consists of businesspeople and serious local diners. Weekends are higher volume thanks to an influx of flashy high-rollers from Los Angeles. According to our waiter, "They're not diners, they eat salads." A complimentary basket of house-baked breads was stocked with two slices of fluffy country bread, a pull-apart spiral shaped roll, a slice of focaccia studded with green onion, a single triangular ciabatta, a round anise roll and an oblong wheat roll. Hidden below the surface was yet another prize, a walnut-golden raisin bun. There was a dish with two pats of butter, one traditional, the other folded with finely crushed peanuts. For my appetizer, I ordered a sophisticated Shrimp Cocktail. An oblong white bowl held a horseradish custard base, a cluster of mixed greens, candied lemon zest and a thin-shaved candied lemon slice. The greens were lined with six shelled jumbo shrimp and ringed with a pour of bright red tomato syrup, which was more concentrated and silkier than standard tomato sauce. The dish was well constructed, with the sweetness of the firm shrimp balancing the bite of the creamy horseradish custard. With my appetizer, I drank a glass of 2003 Gradisca D'Isonzo, a crisp Pinot Grigio from the Venezia Giulia wine-growing region of Italy. The dry wine played well against the richness of the custard. My dining companion started with the Dungeness Crab Martini, from the list of Alain Ducasse Classics that Chef Ducasse developed at his establishments in Paris and Monte Carlo. A martini glass cradled creamy cauliflower puree layered with nuggets of lump crab claw meat. The glass was then crowned with orange foam that was listed as a "warm spicy emulsion." For my entrée, I ordered Roasted Duck Breast, another Alain Ducasse Classic. The exceptional boneless fowl was cooked medium rare. The crispy skin soaked up the drizzle of dolce forte, a burgundy sweet-tart sauce centering on vinegar and sugar. The duck was plated with a candy-sweet roasted black Mission fig and a tender four-inch slab of braised daikon that was topped with bitter white baby turnips and two micro-thin radish shavings. My dining companion opted for Roasted Maine Lobster "Au Curry." Market-fresh claw and tail meat was plucked from the shell of a Maine lobster, set on a bed of coconut-soaked basmati rice and drizzled with a subtly-spicy burnt orange curry. A sprinkling of golden raisins, shaved almonds and oven-roasted baby coconut discs supplied sweet notes. For dessert, I ordered yet another Alain Ducasse Classic, the Mix Candy Bar, actually a duo of bars presented on a rectangular white plate. On my left was a caramel hazelnut bar, with pistachios and halved hazelnuts peeking out of the dark chocolate coating. Inside were layers of hazelnut mousse, chocolate mousse and nougat. A central oval of tangy coconut lime sorbet was anchored to the plate with crispy almond crumble. On my right: a milk chocolate-sheathed peanut butter mousse bar was studded with peanuts and topped with a single sliver of coconut. Both bars were accented with edible gold leaf and deserving of counter space at a top chocolate shop. My dining companion selected the Chocolate Dome. The dark brown half-moon was decorated with a starfield of gold leaf. The rich half-orb held a surprise crème brûlée center. The dessert was plated with an oval of intensely flavored passion fruit sorbet, surrounded by sweet diced mango. Just before our waiter brought our check, he presented us a white goblet of hot Nutella and a tray of just-baked Madeleines. We each plucked a Madeleine from the tray and drizzled on some Nutella with a spoon. The warm Madeleine with chocolate hazelnut sauce was a simple but terrific conclusion to our meal. For all of Mix's style, the menu was surprisingly modest. Thankfully, simple-sounding dishes were much more advanced in both presentation and flavor. The ingredients were clearly of-the-moment, and those views—spectacular. This secluded area features cascading chandeliers and a bird's eye view of fashionable diners below. Against the twinkling backdrop of the Strip, Mix's lush lounge is a stylish escape. Mix's patio provides a quieter and more intimate atmosphere, with breathtaking views of the Strip. Corkage Fee: 50.00 | Per 750ml bottle. 2 Bottle Max. Main Dining Room | Dinner 6 p.m. - 10:30 p.m.
What is the corkage fee for Mix? Please check the restaurant's Info Page for this information. The restaurant also specifies that wines brought in cannot be on their wine list. Mix is known for their great view of the Strip, but they do not have a direct view of the Bellagio fountains. How do I access the restaurant? Mix has a private entrance with an elevator that escorts guests up to the 64th floor of the Delano hotel in the Mandalay Bay. The dress code for this restaurant is business casual. Shorts, t-shirts, tennis shoes, beach and athletic wear will not be permitted. Collared shirts are required for gentlemen. Can I hire an entertainer to sing a message to my mother when we're dining? Do you have any unique features at the restaurant? 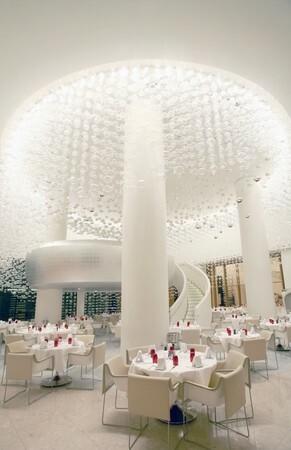 There is a 24-foot chandelier of 15,000 hand-blown glass spheres. Which hotel is the restaurant located in? Hi, I would like to know if you can enjoy a drink at the bar if you are not dining at Mix? Is there a minimum age limit to dine in Mix? No. However, to go to MIX Lounge, you must be 21 years of age or older. petits pois "a la francaise"
USDA prime, plain or pepper crusted 7 oz. Taste of miX Menu $90. Our Sommeliers have created a flight of premium wines to compliment each course of your Taste of MiX menu. Optional wine Pairing $45. Till 10:00 P.M. nightly. Sample menu. Prices are subject to change. Dining at Mix exceeded my expectation. The view was great as well as the food, service, and selection. A great place to take your customers, family, and friends. You won't be disappointed by choosing Mix. This past Martin Luther Day weekend I brought my girlfriend to Las Vegas for her birthday. I was restling with the best restaurant for dinner & choose Mix. Needless to say Mix help me blow her mind. Romantic View of the Strip (we ate on the deck). Martinis where mixed to perfection. The food was well presented & tasetd GREAT!! The chef enticed us for a second visit with several complentary tastes of exotic items. The most key point of my dinning expeirence was the service. I highly recommend Mix. We got there early so we could enjoy a drink in the bar with an outstanding view of the Las Vegas strip. When it was time to dine we were delighted to find that we were going to be seated outside to further enjoy the view. The food was outstanding and the servie was prompt and very professional. The restaurant is classy but not stuffy. I am recommending it to all my friends. If you're thinking of choosing Mix...look no more! This was the best dining experience I had in Vegas. The food, people and atmosphere was outstanding. The cocktails were perfect and the appetizers..to die for. The tuna tar tar and foie gras were AMAZING! I will visit Mix every time I visit Vegas! Great Ambiance, for a great evening with my special "love of my life" to celebrate not only her belated birthday but also a belated Valentine's Day. Very romantic atmosphere, with a great server, the dinner pairing with wine was pricey but well worth it, if you want to set "that mood" for that nite (Wink wink) You can't be cheap when wanting to "fine dine" in Las Vegas, not at MIX, make sure you bring extra cash or credit cards, food was well worth it, with the cheesecake dessert. don't let the title "cheesecake" fool you, very yummy especially with the Pink Champagne bubbly. Great food, service and ambiance. PERFECT for a 1st Date or if you want to impress your special someone. Mix is one of the best that Vegas has to offer. The outstanding views of the strip are backed up by excellent food and service. Overall a wonderful dining experience. Prices are reasonable for a restaurant of this caliber. The wine list is extensive. 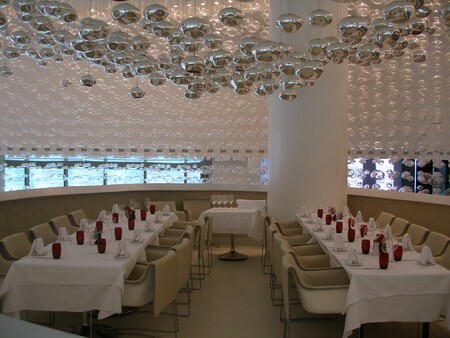 The Mix has a great atmosphere that includes a nice view and really fun glass spheres hanging from the ceiling. The food and service was outstanding. ... YOU MUST GO TO MIX! The food is heavenly, the views are jaw dropping and the service is excellent. Vegas - with a difference. Alex & Rachel - lots of love from the UK! One of the best experiences I've ever had in a restaurant. Phenomenal service and amazing food. Huge recommendation. Great service, food, and view! I gotta say that lasvegasrestaurants.com really made the process super easy. The reservation was easy and quick and I got exactly what I wanted: a great view for a group of 6. We got to eat outside and see the awesome view. The service was amazing and the waiter was excellent with recommending choices for my friends. Great restaurant! Loved the ambiance and the service. Food was top notch, however the room was a little cold. Excellent food, service, view, ambience, etc! Will be back!! An outstanding dining experience. My guests were very pleased and enjoyed the experience as well. Thanks! Absolutely one of Vegas best! Food, service, atmosphere AND the view. Get a table for two by the window and your night can't go wrong. From the view outside to the view inside, Mix had it all. We both had one of the two 5 course menus with the wine pairing and it was out of this world. And it was delivered by a great management team and waitstaff. We traveled from Boston and will certainly be back for more! Thank you! On the evening of our wedding anniversary, my husband took me to the Mix restaurant. It was an incomparable dining experience. The staff was extremely attentive and accommodating. As anticipated the food was succulent to both the eye and the palate. The unique design of the crystal spheres added to the romantic ambience. Excellent food, wonderful ambiance, outstanding service - birthday celebration desert has been created to share.... a little pricey! One of the best restaurants I have been to. The food was amazing along with the ambience. The best food and ambience in Vegas!!! The Mix was a great place to eat. Everything was set up nicely, the staff was professional and helpful. The food was absolutely delicious. 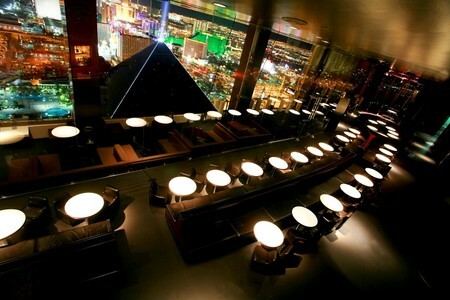 For the most impressive dining experience in Las Vegas, head to MIX at the top of THE Hotel at Mandalay Bay. The views are unmatched, the service is untouchable, the food is unforgetable. It was the greatest,romantic experience I've had with my fiance and id advise any couple coming to Vegas to save some money and to go enjoy a meal and the view at Mix. Had a great time. The moment my girlfriend and I got there, I knew I chose a great place to dine. The food was excellent, service was great, and the view was amazing. The restaurant was so beautiful and the service was second to none. Most delicious steak I've had in a very long time. My husband and I felt very special and catered to. We will definitely go back. My husband and I vacation in Vegas at least once every year and always try a new, well reviewed restaurant. Last year's choice was Mix and knew it was a great choice from the moment we walked in. The decor was amazing and the view stunning. The food was fantastic - pricy but that was to be expected. Along with stunning food and views, the staff was professional and almost too attentive. If you are looking for a great dining experience, Mix is the best choice. Best place ever with amazing service!! This was my first time at the Mix. The service was amazing. Our waiter made sure everything was perfect. Our glasses were never below half full. I just can't say enough about this place. Overall the resteraunt was hands down the best ever!!! Try the cod or the chicken, the best!!! This restaurant was superb on every front. The wait staff was attentive, the ambience and view stunning and the food sublime. We booked MIX for our 5th Anniversary. While waiting we went to the bar which was unbelievably beautiful. Try to book a table for drinks outside on the balcony which has an amazing aura as well as terrific views! We asked for a table inside in one of a few select "cacoon-like" table areas! The best for a special time...loved it all! This was our 30th Anniversary, June 5, 2011, and we wanted to go somewhere that was extremely nice and memorable. We were not disappointed in our experience at Mix. The waiter was excellent but other waiters and managers also ensured we were serviced at a very high level. We were provided a table that was semi-isolated with a great view of the restaurant and Las Vegas. The elevator to the 64th floor is open allowing a great view through the glass and was a quick trip to the top. Happy Anniversary was written in chocolate on dessert dish to top the evening. Great Experience!! We have been to several Vegas resturants, but this is by far our favorite. Not only is the food excellent, it is serviced by an excellent staff in an amazingly designed room. The ambience is wonderful. Definatley a place for celebrations, or a quiet dinner for two. They can accomodate both. The open air bar area that overlooks Vegas is a very nice spot to spend some pre dinner time. Looking forward to going back. We tried Mix for our anniversary dinner after reading reviews on the internet. I am a local and was EXTREMELY impressed. Not only was the ambiance fantastic and service was great, but the food was amazing. We ordered appetizers through desert and everything tasted fantastic. The shrimp cocktail cut up and mixed around so it was "messy" was very tasty. We also ordered the half order of assorted meats to finish our first round. For our main courses we shared the cod and the filet. Both meals were spectacular. We closed with the chocolate souffle with rocky road ice cream. Awesome! They also made our anniversary feel very special and brought us out a separate desert which closed out a perfect evening. Thanks!!! We will be back!!! Great ambiance...food and drinks were delicious! great evening to celebrate my birthday with my family! special evening ant a very special place!! can't wait to go back!! My wife and I ate at Mix and had a great meal. Service was excellent and the food was among the best I have ever had. The shrimp cocktail was more like a shrimp salad and tasted amazing. My filet was cooked perfectly and the bernaisse sause made it even better. My wife had the scallops and enjoyed them very much. It was a memorable and enjoyable meal. We had a pre-valentine's day dinner, my first time visit to a restaurant that they have sommelier. The waiter is very professional on wine. We had a great time there. Made reservation through the web, the staff has reached out to confirm a day prior. The ambience the quality of food matched with wine at every dish were outstanding!!! Some wines were a really extravagant choice for the combination , for example 2007 Gewurztaminer Alsace with roasted lobster. The interior of the restaurant is modern and has a lot of intellectual investment design-wise. i would recommend picking the spot at the window to enjoy the city lights or one of the modern looking booths. Generally , the balance of taste, food combination and ambience makes you think of returning here more than once. Two thumbs up to the chef and the staff! I ate at a lot of places while I was in Vegas, but Mix was the BEST place I ate at. The waitstaff is phenomenal, the food was heavenly and delicious and the ambiance of the place was breathtaking and elegant yet modern and relaxing. A perfect spot to take your significant other OR dine out with friends. A little pricey, but worth every penny!! The serviced and ambiance was great. Prices were a little high but perfect at Restaurant Week prices. Nice and great restaurant, excellent food and service...Fantastic experience !!! We were in Vegas for a short vacation and wanted to have a dinner that looked over the strip. In the past, we have had dinner at restaurants that overcharge for the quality of food they serve. Every expectation was met when we had dinner at the mix. We requested a view of the strip and they immediately asked if we'd like to dine outside. Duh! It was beautiful! We ate dinner and were able to watch all the lights of the strip come on and enjoy the beginning of the night that way. Anyway, to the FOOD! We were both skeptical about what to order because we've been let down frequently by $70 filets, duck, or lamb. We asked our waiter how the bison was and he was spot on with the explanation. He even came back after we ordered and suggested the perfect merlot to try with my dinner. Again, spot on. The first bites we took were of the vegetables that came with our bison and they were so juicy and flavorful. We also had asparagus which was unbelievable as well. They peel a layer of the outside off so you don't have that stringy part to chew through. The first bite of the bison was mind blowing. I cannot express how impressed I was and still am with the meal. (We're still trying to find bison around our area). I'm normally not a dessert person by any means but I have a secret weakness for mint chocolate ice cream. I ordered that with crunchy chocolate pearls and I've never been more satisfied with an after dinner treat. The mint they use in the ice cream is clearly mint leaves and it's an unreal flavor. When we were about to throw in the towel, our waiter came by and told us our complimentary dessert was still on it's way. How kind :). They brought out a small chocolate dish and little vanilla truffles, perfect for a couple bites and we were both comatose for the next 2 hours. And I can honestly say, I didn't feel guilty about a damn thing I ate there and I'm typically very cautious about carbs, sodium, alcohol, atc. You have to try it. The ambiance and the view are perhaps the best on the strip. But this even takes a back seat to the exquisite cuisine. I highly suggest the wine pairing, though a bit more expensive, it was well worth it. The wait staff were very attentive and knowledgeable of the food offerings. The food was masterfully presented, and quite honestly was a work of art in and of itself. If you desire a once in a lifetime dining experience, Mix would be it. Fabulous atmosphere, food and service. We selected the tasting menu and it was superb. Our waitress was engaging and made sure to ask if we were seeing a show after dinner to ensure we were in and out in a timely mannor. I would come back again and recommend to anyone looking for a great night out. Definitely recommend this place as a "Must" while visiting Vegas. For our anniversary it had everything. Great place great views fab food and service. The decor is breathtaking, the view is beautiful, the food was amazing, and service was quite good. However we did notice that service slowed once the restaurant started filling up. We had the chef's tasting menu..pricey but delicious! Our only complaint was how the tables were placed so close together. Luckily we arrived early so we spent the beginning half of the meal feeling like we had our own space. But then a couple was seated right next to us and it felt like we were sitting at the same table. That couple even offered to take a picture for us which was nice but still a little awkward when you're trying to have a romantic birthday and pre-wedding dinner with your fiance! The ambiance is so romantic and beautiful and we expected to have an intimate dinner at a restaurant like Mix. Instead we felt crammed in there like a hole in the wall ethnic restaurant! Despite that I would go back! The restaurant and bar are beautiful with a spectacular view of the strip from the 62 floor. The waitstaff was very attentive and without being pretentious and the food was very good. There could have been a few more selections on the menu but the choices they had were delicious, especially the foie gras and the dessert. Great Views! Good staff. A pleasant dining experience. Originally seated in (extremely!) loud main dining room- hard surfaces reflect noise, and boisterous crowd, including children ( 8 PM reservation ). Moved to balcony- major upgrade- great view ,much quieter, should have had more attentive service. Our waiter was pleasant, interested, and knowledgeable, but appeared flustered at times, as if he had too many other tasks going on. Food: appetizers very good (foie gras to die for),Fish main course bland ( Halibut and Sea Bass). Recommend "Candy Bar" for dessert. We decided to go to Mix following our wedding because we had heard about the views which absolutely met expectations. The food and service were amazing, we had the taster menu and I had the wine matching which really did enhance the experience. It was a shame that despite requesting a balcony table on our reservation, this was ignored and although the restaurant was not busy we were shoe horned into a corner where they actually had to pull the table out to let us in. Definetly one of the best meals that I have experienced in Las Vegas. It also has the best view of the strip while you enjoy a drink or 2. Next time you're in Vegas and seeking a FANTASTIC venue for great French food then it has to be MIX... Service was fantastic and the meal was amazing. Staff went out of their way to assist with all our requests. A really great night to end a memorable holiday! Have no hassles returning there next time I'm in Vegas... Oh and dont forget your camera for some great shots of the Strip from the Balcony! The view(s) of Vegas are outstanding! Although the lounge was not especially busy, I would have preferred not to have to walk through it to get to the restaurant. We were seated against one of the outside (glass) walls. While this was a great place to enjoy the view, we were seated MUCH too closely to other patrons. It made our desired quiet, intimate evening virtually impossible. The food was outstanding except for the two side dishes we ordered (wild mushrooms, and spinach). Both of these were over-salted. The food was flavorful and attractive,utilizing seasonal and local ingredients. The server was attentive and pleasant. The bus persons were very friendly and polite. I enjoyed my evening ,celebrating my wifes special 50th birthday! I would definetely look forward to another meal at mix. I was seated outdoors on their patio, and the view was beautiful. The server was very attentive and even offered me a glass of champagne immediately after being seated. The wine by the glass, an Italian red, was delicious. I couldn't decide on what to have for dinner, so I chose the tasting menu that was available that evening. It included a very delectable piece of Halibut as well as a very tender steak. Although the food was great, sometimes the wait between courses can be a bit long. So, if you're up for the experience, and your not in a rush, I say go for the testimony. It doesn't disappoint. Recomendable place and the bar is great. My wife and I absolutely enjoyed our evening at Mix. It has a truely unique ambiance. The view is spectacular and the food was magnificant!! If you're looking for a nice romantic evening I would highly recommend!! 3 thumbs up!!! We had high expectations going in to Mix and they did not disappoint us. The food was incredible and service was superb. The view is one of the best in Vegas. One of the best restaurants in Las Vegas! Food is excellent and view from the outside patio is unbelievable! A great dining experience! pricey but tasty meal, great view and overall great experience. Cuisine was overrated and over priced and service was sub standard. The decor and concept is solid, but my experience was less than expected. We celebrated my wife's birthday at Mix and we were seated facing the industrial part of town. Since our room was just a floor or two below the restaurant,but looking down the strip, we could have ordered room service and had a better view with dinner. I was not impressed with Mix, there are far better experiences in Vegas to be had. However, in all fairness, if you have a the right table with the right server, perhaps the experience could be better. Overall the food was very average. Food was very good, though a bit overpriced. Service was friendly, though with a big party was a very long meal... took a lot of time to be served each course. We requested a window table which was provided. Not a great orientation to see the strip but nice. Service was a little lacking after a large wedding party arrived. I got the feeling that if I wasn't going to spend $200 for dinner for the two of us, the waiter was more interested in other tables. Wine choices by the glass were excellent. Food was good. Made the reservation as an anniversary dinner but there was no acknowledgement. Next time I'd probably skip dinner and just have a drink in the outside patio bar and enjoy the view from there. Go to the bar for a outlook of Las Vegas . Not impressed with food or service. Would not go back... to many other great places to eat and drink. expensive for what you get. For the same or of lesser price there are many more places to choose from. Great service, but a bit noisy and cold. A great stop for the view nothing else. Go for some drinks. Skip the dining room. Totally over rated. Cool place to experience. The food is awesome but the service was lacking. They will bend over backwards for large parties but if it is just 2 or 3 of you, forget it. Our evening at Mix suffered from over-expectation and poor ambience. First off, having to trek a 100 yds through the bar and then the kitchen was a clue. When we finally got to the dining room, the dazzling sights shown in their pictures were not there. The views out the window were great, but the brilliant white walls and sparkling glass balls of the massive chandelier were lost in the dim light and very apparent dust on the balls. Service was adequate, but more like a diner than the polished elegance one expects in a fine dining establishment. Our experience was further marred by a large party of 20 people of so at two nearby tables, that instead of being seated, stood and socialized, with many standing immediately by our table. A less than comfortable experience than we had to ask to our waiter and maitre de to do something about twice. The food was good, but not memorable. I won't return, nor found anything other than the view to recommend about Mix. Mix Restaurant in Vegas I can do without. When I walk in the person at the front desk did not fine my reservation. I had to show them the confirmation email. Not even a smile. The person who took us to out table must have been having a very bad day. Never smile or spoke. The first table they wanted to give us was by the kitchen. We asked them to chnage it and she said that they were all reserved. the restaurant was empty. it had 3 tables occupied.It got busy when we were departing. The food was outstanding! The waiter was not as "upscale" and professional as I would have expected for this type of restaurant. Also, this was our 10th wedding anniversary and I noted that upon making our reservation. The hostess acknowledged this when we checked in and then tried to seat us at a table without a view. We were eventually moved to a table by the window. We had a great waiter and a nice seat so the mood was right...until we got the food. Started out with stale bread, an ok prawn salad (which we thought was going to be a prawn cocktail), than terrible main dishes. I had a cod (which was their substitute for being out of halibut) that was drown in butter. Others were just as disappointed with their meals. UGH! WE WAITED AND WAITED ON A SPECAIL DAY AND WE WERE TURNED AWAY. The food is highly overpriced for something that is not even that good. The food was very plain, nothing special about it. The service was alright. But I would not recommend anyone going here if they are looking for a good restaurant and good food. I would not recommend anyone to go here. The food is very plain but over priced. The service was okay. Date night for me and hubby! It's a great place the food was awesome, but the service was horrible. We paied over 200.00 and you would think that if you dropping that much on two meals the service would be on point. They need to make sure that people are trained on providing the best service possible to keep them coming back! Slow service, mediocre food, expensive, nice view so just go to the lounge for a drink for a minute and skip dinner it's not worth your time or money. Portions where very small and everything was way over priced. I ate here several years ago and it was awesome. The food just was not a hit this time. Sorry but I expected more!! We had a great table outside at the Mix with amazing views of the city. We were quickly seated and menu's presented nicely. Subsequent visits to our table were lacking and resulted in less sales of both food and liquor.